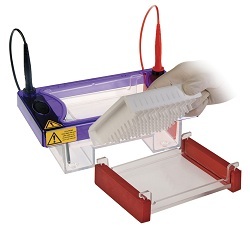 THE RANGE of electrophoresis products from Cleaver Scientific has been bossted with the addition of the MultiSub Midi 96, which allows direct loading from 96-well plates. Samples can be loaded from the plates using a standard eight-channel pipette, eliminating smple identification issues, and processed in electrophorsis runs which take typically just 15 to 30 minutes. Cleaver’s range includes horizontal and vertical gel electrophoresis tanks, 2D systems, a variety of blotting systems, comet assay, DNA sequencers, and gel documentation systems. The company offers a range of options for gel size, sample number, and volume, along with five thicknesses of comb. Further comb options include double-sided, two-in-one combs, and combination combs including a loading guide. Gel sizes are available from 7x7cm to 33x45cm. Most tanks in the electrohoresis range have a rapid cooling set-up, with no chiller required, to quickly provide high resolution results at low cost.